It turns out that one of my good friends has been working on Google Plus! Very cool. It seems to have some quirks, but it’s been fun playing around with their interface. Some of their UI details remind me of the old metails.com/yub.com interface, but that is looooong gone. In any case, I appear to have invites to send out. So… If you are looking for a Google Plus Invite, let me know and I will do my best to share the love. As I mentioned in my last post, for the past few months I have spent some time working remotely. I work for a company in the USA that has been extremely flexible about letting me work remotely, and I am grateful for that, but working internationally hasn’t come without challenges. Granted, my stays overseas have been relatively short, so I can put off the hard stuff until I am local, but there are still plenty of discussions and collaborations that I didn’t defer. Choose your communication tools and make sure you know how to use them! I rely on E-mail, IM, and Skype. E-mail and IM are obvious and easy, in both cases my company had those set up. Making video and phone chats really painless has proved to be an effective method of staying well-connected to my peers. I don’t think working remotely would be nearly as effective without this. For international calls, I chose Skype because they seem reliable and have decent pricing. I set up a “local” (US) phone number that forwards to my Skype for a low, fixed cost. Calls in are free, and I pay a low rate when I call out. The service isn’t enough, in addition I use a wireless headset from ASUS so I was ready to take calls at all times. Plan ahead for getting real work done on a remote machine and also plan for what is going to be hard/impossible over a VPN. One of my best remote tools is a Virtual Machine that replicates my server-based development environment. For most things, I can work and develop in my local environment. But sometimes, just committing code to the remote SVN repository is insufficient and I need to run interactive jobs on faraway machines. For that, VPN + NX seem to provide the fastest model for UI interaction (even from the terminal). Align your hours when possible. Depending on how many timezones you are hopping, this may or may not be feasible. But, if it is possible to plan your free time so it lines up with when coworkers are sleeping, it makes work so much easier. Whatever hours you end up keeping, be consistent and straight-forward with colleagues so they know what to expect and can avoid the kinds of nasty surprises that happen when you checkin broken code and then go offline for 8-12 hours! While this list is certainly not exhaustive, it captures at least some of the things that have helped to make my remote development experience reasonable! Apologies for the long delay in posts. The run-up to and through the summer has been eventful, especially on the personal front where I have been spending about two weeks living and working (remotely) from Israel. Quite a change of pace from being in either Chicago or Boston. There’s been plenty of fodder for posts, but not so much time to write. However, I decided it was worthwhile to take some time out to write to help me collect my thoughts on planning. For the past 5 or 6 months, I made a push to try to organize how we complete “infrastructure” projects at work. I define infrastructure projects as those that don’t deliver a specific tradable strategy, but instead provide tools or reports that will be used to help accelerate the creation of or improve the quality of these more tangible deliverables. There is broad agreement that infrastructure work is critical to the success of our organization. Yet, somehow, we find it difficult to consistently make substantive progress against our infrastructure goals. I don’t think that this is for lack of definition on the goals — I spent many hours working with our CTO to hammer out and prioritize potential projects. I suspect that there are a number of complex issues that are limiting our progress, at least one of which is a lack of committed focus from developers to infrastructure projects. While I have been primarily focused on building and extending our infrastructure, most other developers have split their time with the balance typically tilted more towards working on delivering and maintaining trading strategies. The theoretical 25 to 50 percent that is left for infrastructure work seems to often get lost to fighting fires or just one more analysis. With this in mind, my CTO and I determined that we would start making plans that did not count on the contributions from developers who didn’t have the majority of their time committed to the infrastructure development projects. I am sure we will still get some interesting contributions from the other developers, but it will be more opportunistic and less planned. The question that remains is how my infrastructure-focused team will organize itself. Previous to my current role, I spent a few years leading development teams that followed the Scrum project management methodology. As a Certified ScrumMaster, it seems appropriate that I might return to running sprints with my team. To that end, I suggested that our CTO check out Agile Project Management with Scrum, which I thought was the most accessible of the books that I have read/skimmed on the subject. I am interested to hear his reaction after spending some time reading and thinking about how to Scrum. That’s all well and good, but I’m not convinced that we should go to Scrum without some more thought. While my previous teams have been successful with Scrum, it always seemed that there was room for improvement – even beyond what could/would be achieved through the team’s monthly retrospective efforts. For example, it often felt that the team’s planning process was relatively forced. As the ScrumMaster and the manager of the team, I often felt like I had to push hard to get real, consistent involvement in planning from team members. We experimented with other approaches to planning that were suggested by some of my great team members, for example, assigning out “pre-planning” work to individuals or pairs from the team, so there would be a de facto technical owner other than me who would be engaged and well-informed and could therefore help to push ahead the planning meeting for each story. I think that helped, though I wonder whether we lost some of the benefits of Scrum by doing this in that others on the team may have felt like they were not as accountable for those stories. The right answer is probably to keep tweaking small things to make the team more effective, but perhaps the retrospective questions shouldn’t be “how to scrum better”, but simply “how to work better”. The main contender to the Agile project management throne, as far as I know, is Kanban. I haven’t used it, but plan to read up on it over the next few days to figure out if it might be a better fit for our organization. Or, more likely, whether it would be worthwhile to run some experiments with some teams running Scrum and others following Kanban. I am excited at the prospect of rethinking how to improve the planning and execution of software projects and am also open to other suggestions or feedback if anyone has any. I flew from Chicago O’Hare to Washington Reagan this weekend to visit some friends that recently bought a condo and have a baby on the way — double congrats! I toted along a bonsai tree as a housewarming gift, which is definitely on the odder side of things I have flown with. I was a bit frightened by the prospect of laying the small tree down in an overhead compartment, especially given the DCA runway. For those of you who have not flown into Washington Reagan, the runway seems to be relatively short and ends in the Potomac river. For these well understood reasons, flights into DCA end rather abruptly in my experience. I had visions of the bonsai being transformed instantly into kindling. Luckily for me and my little tree, when I boarded the plane one of the attendants saw my bonsai-in-a-tote-bag and offered to help me out. She took the tree and spirited it away somewhere up in the front of the airplane where it would be safe from being crushed by carryons and apparently was secure for the landing as well. The small closet up front appeared to be full, so I am not quite sure where my little tree disappeared to. But, lo and behold when I exited the plane it was ready for me and seemed to have enjoyed the flight! American Airlines and Susan (didn’t get her last name) rock! It was a pleasant experience and it moved me to use the first of my “compliment cards”. As a Platinum-member of AAdvantage, I got a booklet at the start of the year that contained details of the program as well as a number of certificates that can be given to American employees that go above and beyond. I’m not sure what benefit they give to the employee, but I hope it’s something nice. Each yellow dot represents an aircraft in flight. At the start of the video, the “shadow” representing nighttime covers the Eastern US, the Atlantic, Europe/Africa and the Middle East. Over the next minute or so we see a day’s worth of traffic represented as the shadow moves from East to West ultimately returning to its original position after a full day is completed. Having flown trans-atlantic evening flights, I recognized at the start of the video how night descends on the US as many flights take off across the Atlantic, pass South of Greenland under the shadow of night and reach Europe as the sun rises. I looked for signs of my recent trip to Taiwan and Japan: flights leaving in the morning from US and chasing the Sun westward, but found relatively few flights. Interesting to see the relative amount of traffic from US to Asia as compared with trips to Europe. Travel within the US and within Europe is amazing! It’s like watching bees in a hive. WOW.﻿ Brazil is conquering Portugal by airplane. Perhaps it’s not quite that extreme, but to my eye there is greater travel between former colonies and their colonizers. I don’t know whether that is family-driven, long-standing business ties, or is simply an impact of language familiarity, but it does appear to be a real phenomenon. Flights that go through the arctic circle are quite common, antarctic not so much. At around the 0:50 mark I noticed a flight leaving southern Africa bound for Australia that dips pretty far South. One lone craft covering a lot of otherwise empty-looking ocean/mapspace. What other interesting trends do you see in the images? Last summer I put together a series of riddles/puzzles that were intended to be solved over the course of a week visiting New York both with and without the help of the internet. The puzzles or clues were similar to what you might find in geocaching, Urban Challenge/Urban Dare, or the MIT Puzzle Hunt. The overall game was not aimed at the public, though I supposed anyone might be able to work their way through the clues. A handful of the clues remain in the archives of the blog, though some of the clues (including the first one) were hidden in other places on the Internet. If there is interest, I will write a follow-up post that provides the introduction/starting prompt and I will re-vet the existing clues to make sure they are public consumable without too much out of band communication. I came across a thread recently on FlyerTalk that brought up the point that all miles count towards the AAdvantage Million Mile/Lifetime Gold; i.e it doesn’t matter if the miles were flown, bonus, earned from credit card purchases, etc. Although I reached status for the first time last year and logged just over 50,000 miles on American, I am suddenly seeing a new goal :-P. I suspect it would be a challenge to earn the requisite 800,000 miles or so before the end of the year without going through some extraordinarily expensive combination of flying and spending, it seems that while I will make Gold (or Platinum) again for next year I can also put myself on track to get to lifetime status the following year. In particular, with the help of the Citi AAdvantage cards (see FatWallet discussion), I think I may get halfway there this year. If you know of other good deals on earning miles on American, please let me know! I’ve never had a chance to play around with guitar pedals (except when I played at the House of Blues in Chicago, which is a whole different story), but I was intrigued when I read about a new product from Line 6. These guys produce all kinds of guitar gear, specializing in effects boxes and pedals. My guitar school has one of their “Pod” units that has a bunch of effects programmed into it. For the past few years they have been selling so-called Tonecore pedals that have been pre-programmed with one of a handful of effects combinations. Now, they are selling a Tonecore DSP Development Kit, which purports to let developers create their own effects by writing custom code. This definitely piques my programmer spider-sense despite my lack of experience with Digital Signal Processing or writing assembly, which I suspect will be required. I might go ahead and get one to play with, but I would love feedback or comments if anyone has tried this kit out for themselves. Wait, they don’t have *any* snow? We have been in San Francisco this weekend exploring. On Friday, we had food and beer in Mountain View at the Tied House. To me, the valley seems very suburban, but I suspect (and am assured) that I am mistaken because I am used to equating car-centric neighborhoods/towns/cities with uninteresting suburbanity. By contrast, yesterday was spent in downtown San Francisco and the Mission. These areas feel much more active and alive to me and seem to be more of “my kind of places”. All the accoutrements of yuppie life without the absolute necessity of a car – city-center farmer’s markets, bi-rite ice cream (yum! ), lots of bars and specialized restaurants (southern indian cuisines), etc, etc. Despite the not-so-expansive reach of the BART, today we are taking it across the Bay to visit Berkeley. We have gotten some great recommendations for things to see, high and low end things to eat, but if you have personal favorites – send me a text or leave a comment below. An interesting thing happened to me when I started splitting my time between two cities. Unshockingly, I found that I needed two of many things. While this is to be expected with the necessities in life, it has had some effects that I have found both interesting and enjoyable: sometimes I end up getting more of a good thing this way. It turns out that I work in the same building as Guitar Chicago, which means that I can take a guitar lesson without wasting time leaving the building and traveling somewhere else. I haven’t taken guitar lessons in years (since around 2000 if I recall correctly), but buying a guitar and subsequently taking lessons has prompted a small renaissance in my musical studies. More pertinently for this post, this renaissance refueled my interest in having guitars to play at home. 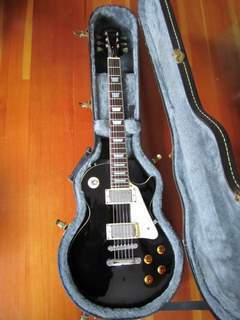 Back in Boston (and since about 2000), I have had an electric, Epiphone Les Paul Standard guitar. It’s a thing of beauty. It makes me happy just thinking about it. I was in love with this guitar. I was an awful guitar player, of course, but I didn’t let that stop me. I gave it a name: Black Eyed Katy (after the Phish song that was later renamed to Moma Dance), I bought all the possible accessories including the hard case that you see here. And for the next few years this guitar completely replaced the Yamaha acoustic that preceded it. In the years after I graduated from college I played less and less and in time deposited the guitar at my parent’s house instead of moving it from apartment to apartment. As expected, BEK never made the trip to Chicago. However, a few months after I had bought an acoustic guitar and started taking lessons in Chicago, I again felt the lust for having my own electric guitar to play at home. As I looked at guitars on Craigslist, I knew I wasn’t looking for something as beautiful as my Les Paul Standard, but instead was looking to fill a different niche. 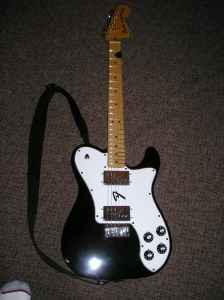 What I found was a remake of a classic Fender Telecaster. I played a Telecaster many years ago when I took lessons the first time around, so I knew I would like the feel and sound, it was just a matter of finding something that wasn’t exorbitantly priced (i.e. not Made in America – Mexico would do) and a seller who I could actually get to. I found what I was looking for, custom colorization, Fender “F”, and all :-D. Though I ended up needing to take a ZipCar out for a couple hours to go pick up my new guitar, it was well worth the effort. Having an electric in my apartment means that I can play acoustically or with headphones and not bother the neighbors. It’s also amazing how different this guitar feels than my set up in Boston. Not being a professional musician, I wasn’t sure that I would be able to appreciate the difference between two very different guitar makes. Now, while I still couldn’t tell you the first thing about humbuckers or single coil pickups or any other part of a guitar for that matter, I have a much stronger sense of what the differences in the neck and overall weight of the Les Paul Standard versus the Telecaster. I don’t have a clear favorite, but they are definitely different! To finish up, I should point out that I recently brought Katy in for a full tune-up and got her all set up with new strings so I am set to rock out in Boston. And, in Chicago, the Tele remains nameless… so far.